Sausages occupy a great part of our daily breakfast or meal. We always have the option to buy frozen sausages but it lacks the taste that we enjoy in a homemade sausage. However, preparing sausages at home can be very problematic if you do not have the proper device. Thus, the sausage stuffers are the perfect product for you. Having a proper stuffing cylinder and a gear crank design, the sausage stuffers prepare the sausages mechanically and efficiently. In other words, they completely relieve you from all the stress. Furthermore, they are manufactured from food grade stainless steel. Thus, you will be able to use them without any hassle. Options are too many but the choice to be made is only one. Nevertheless, we have come across the most trustworthy stuffers. 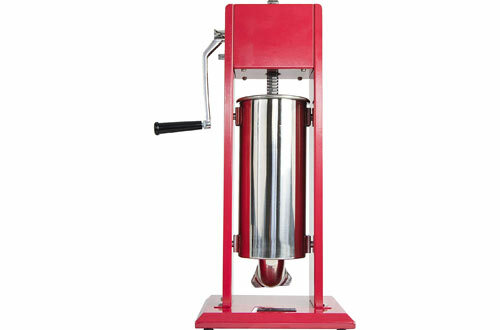 So buy a sausage making machine after gaining knowledge from this guide and thoroughly enjoy. 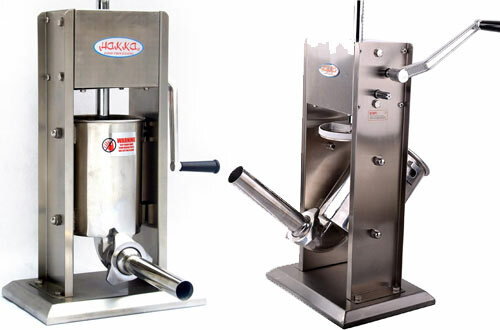 With this stuffer from Hakka Brothers, you will have no trouble in making sausages. The best thing about this stuffer is that its cylinder tilts backwards for efficient filling. Plus, it comes with an air release valve that helps the air to make its way out for better meat stuffing. The Hakka Brothers stuffer promises an advanced design. As a result, you can be completely assured about the trouble-free operation. Another important thing about this stuffer is that it has a stainless steel frame which provides stability and lowers friction. Completely easy to use and offers quick as well as efficient functioning. The parts that involve direct contact with food meet SGS hygiene standard. The stuffer weighs 7 lbs. 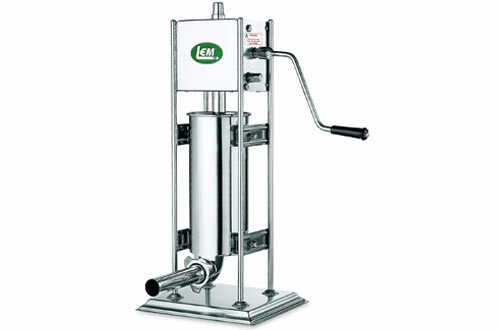 If you are looking for utmost efficiency in a sausage stuffer and grinder, then this one from LEM Products has to be the one. Equipped with a huge drive gear along with a strong piston rod, it can easily withstand the pressured needed to stuff even small sausages. Furthermore, this stuffer guarantees a sturdy frame having been equipped with solid stainless steel bars. 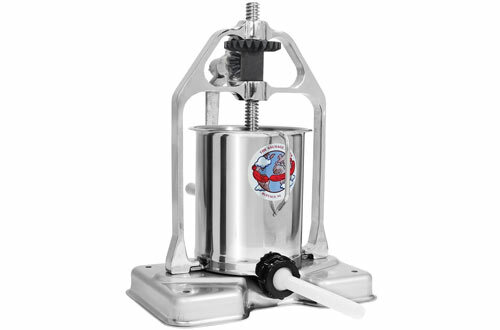 The stuffer offers the convenience of a two-speed design where the high speed helps in an efficient filling and low speed helps in stuffing casings. 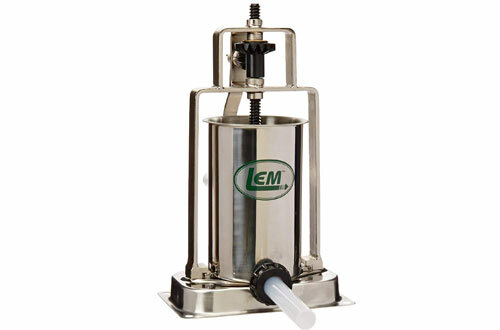 The removable stainless cylinder makes cleaning process smoother. Equipped with a large drive gear, other metal gears and a robust steel piston rod. For avoiding any sort of leakage, the cylinder has been sealed with a heavy-duty rubber gasket. 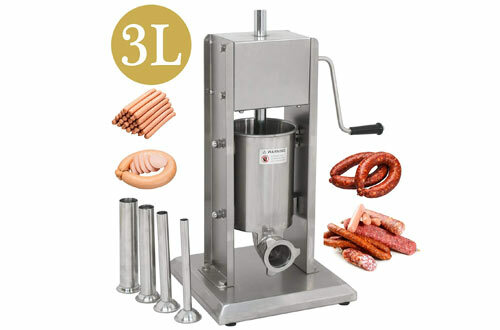 Presenting another great sausage stuffer maker from LEM products. With a 5-pound weight capacity, this stuffer is completely built of stainless steel. This stuffer comes with also a Home sausage making guidebook which helps you to learn the process minutely. In addition, it includes a variety backwoods seasoning to make excellent quality sausage. Furthermore, you get access to a pack of collagen casings. Has a weight capacity of 5 pounds. 5 transparent fibrous casings are also included. The STUFR-V205 from Vivo is undoubtedly an impressive product that will not let you down. Having an 11-pound weight capacity, it includes a stainless steel cylinder as well as a metal base for maintaining steadiness. Installed with complete metal torque gears, this stuffer offers long lasting as well as efficient performance. In other words, this stuffer is a perfect tool for beginners as well as professionals. Features a complete metal construction. Comes with a dual gear crank system. Has an air release valve for facilitating quick getaway of the air and the stuffer will not overheat. Approved by RoHS, SGS food standards as well as LFGB. 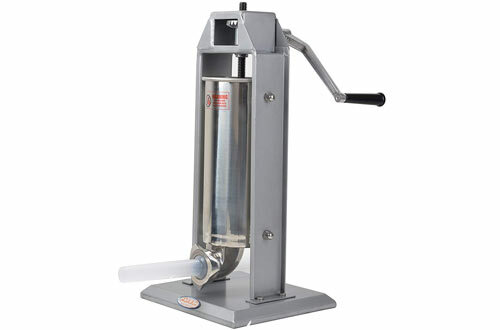 With the Super Deal sausage stuffer for home as well as commercial use, making sausages became an easy task. 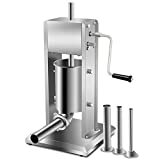 Having a sturdy stainless steel body, the Super Deal sausage stuffer is completely durable and features a barrel that is 90-degrees tiltable. Another recommendable characteristic is its removable cylinder which makes it easy for you to fill the cylinder. Further, with four different filling tubes, it caters to your different requirements. The stuffer also makes use of lock nut that eliminates the threats of leaking. Offers maximum quality guarantee with SGS standard of hygiene. Given four nozzles in the base plate for obtaining full stability. The right, as well as left-handed users, will not face any trouble for operating this. Made appropriately for allowing mounting on a table. Hakka Brother is emerging as a winner of the stuffer for the sausage industry. Well, the very first thing that makes this sausage maker so attractive is its stainless steel construction. Also, the stuffer even has a stainless steel cylinder as well as spouts along with a metal base and crank. Thus, you can be completely assured about the durability of this device. To make it more purchase-worthy, the cylinder tilts very easily which makes it easy for you to stuff it. Moreover, it also includes an air release valve that maintains the air flow and so says bye-bye to overheating. Quick disassembling process and cleaning process. Full metal body for tolerating heavy-duty operations even in the long run. Easy to fill since you can easily tilt the cylinder. 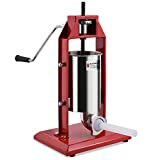 This vertical sausage stuffer maker from Kitchener is obviously a thoughtful selection you can make. 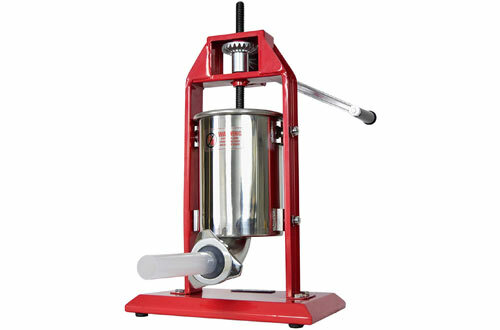 As its name suggests, this vertical stuffer features completely long-lasting and robust stainless gears, frame, cylinder and base. With the help of this durable yet efficient structure, making sausages becomes a child play. Features a vertical design, this stuffer is easy to use and operate. Plus, you can also remove the cylinder to fill it easily. Obtains it strength and excellence from a heavy duty construction. The cylinder is removable for filling and cleaning. Air release valve protects the cylinder from overheating. Well, it seems like Vivo has some of the best sausage stuffers in the market. 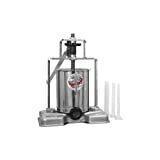 Now, you have the guarantee as well as complete certification from SGS, LFGB and RoHS, the Vivo sausage stuffer maker assures you completely about its quality. Manufactured from stainless steel, one will receive high durability and robustness. Most importantly, the piston of this stuffer includes an air release valve which helps in protecting the cylinder from overheating. Having an 8.4” cylinder, one can stuff in up to 7pounds meat. The four nozzles are built of plastic. The sausage stuffer handle is plastic-made. A heavy-duty sausage stuffer, this one from Goplus is an intelligent buying choice that will not cheat you during emergency needs. 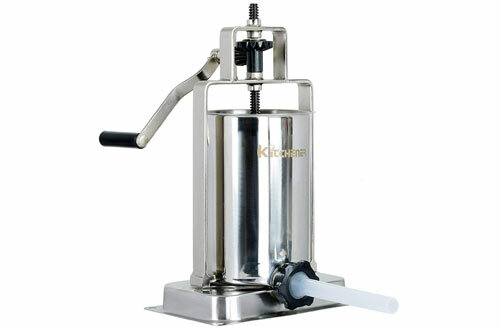 With one speed cranked piston design, you can relish on delicious sausages in a matter of seconds. The mind-blowing feature about this stuffer is its design which consumes less space and is completely ideal for home as well as commercial usage. To conclude, functionality and cleaning is no more a tension. The size of each sausage funnel differs from one another so that the users do not go out of an option. Sitting on the first position in our list, this sausage stuffer has to be the most flattering one that you can find in the market today. 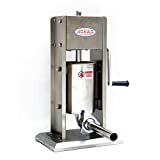 Apart from a weight capacity of 15lb, this stainless steel vertical sausage stuffer comes with a stainless steel rod with Acme thread and hand crank. 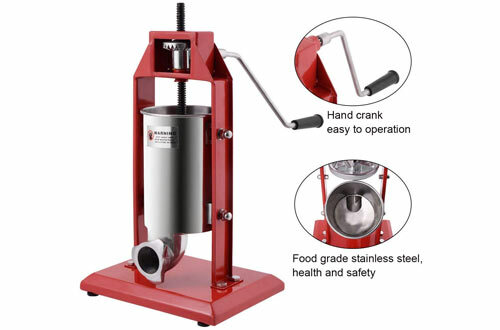 The removable cylinder is created from food grade 308 series stainless steel. So, it is completely safe to use. Lastly, it has the support of lubricant resin gears for maximizing productivity. To minimize the chances of blowouts, a pressure relief valve is installed in the piston head. The capacity of stuffing 15 lbs meat is huge. Never go out of sausage at your breakfast specials or any time of the day. The sausage stuffers will help to make proper sausages within a few minutes.